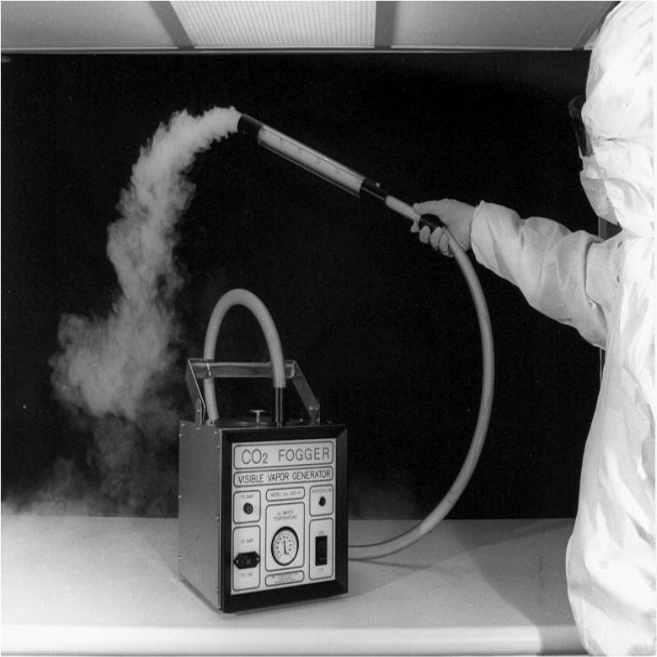 The PWC Clean Room CO2 Fogger uses dry ice to generate visible vapor for studying airflow patterns in Class 10-10,000 pharmaceutical and semiconductor clean rooms, production facilities and laboratories. The PWC CO2 Fogger is essential for assuring conformity with Semiconductor Clean Room Guidelines SEMI S2-0712b and SEMI S6-0707E for airflow, pattern and turbulence visualization and USP 797 Pharmaceutical In-Situ Airflow Analysis. 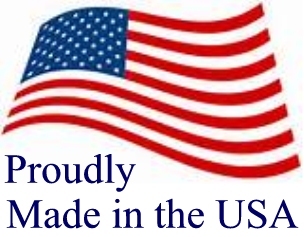 The CO2 vapor is non-contaminating—leaving no residue and therefore no wash down of clean room surfaces after testing. 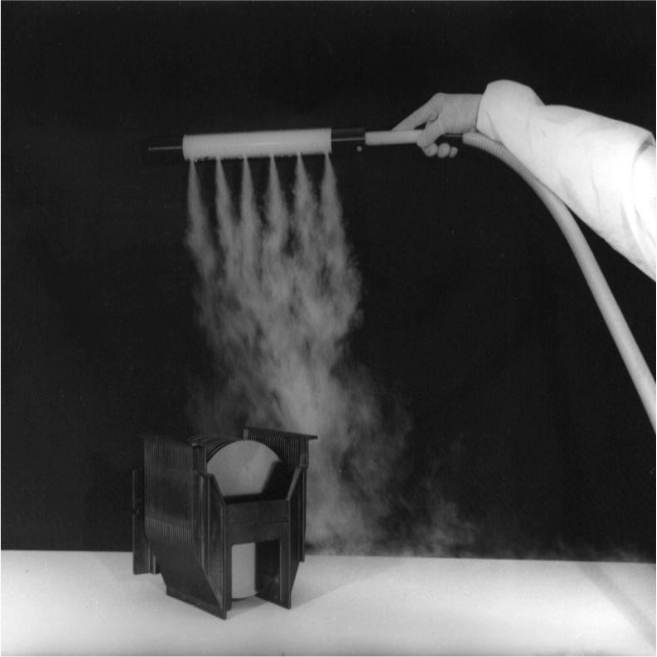 Consisting of CO2 gas and DI water vapor, the fog is produced by placing a dry ice block in heated DI water reservoir. The fog is generated continuously over a 10-12 minute period until the one-pound block of dry ice vaporizes completely. 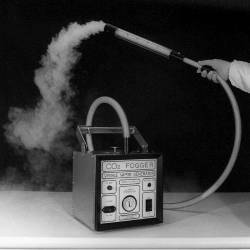 During operation, the CO2 Fogger can be unplugged and carried from area to area. Its small size and weight add to its portability. Since it requires no power source during operation, the unit is safe for use in hazardous locations. Fog is produced at approximately 3 cubic feet per minute. Attached to the end of the flexible fog tube is the wand, which can be adjusted to produce three different patterns of fog-- a jet, a cloud or a curtain. 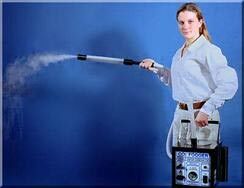 The CO2 Fogger is particularly suited for verifying laminar airflow, wet bench exhaust efficiency, ventilation in process equipment and set-ups, pressure balancing between rooms, and general airflow and turbulence visualization in small areas. 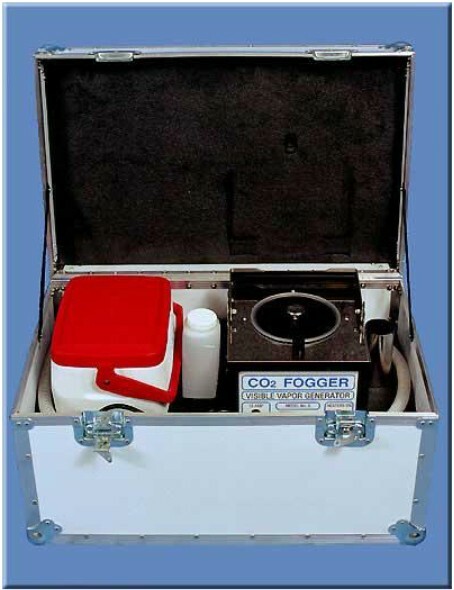 The PWC CO2 Fogger comes complete with fogger, hose, wand, cooler and DI water container, instructions and a wheeled, foam-lined carry case with pull handle. Take control over the purity of the dry ice blocks used in your CO2 Fogger by making your own with the Frigimat® CUB Dry Ice Block Maker. Simply attach the hose to a cylinder of liquid CO2 and the other end to the block maker. Open the cylinder valve and a one-pound block of dry ice will be made in approximately 2 minutes. Order below.